Theatre New experimental playwrights are writing about the contemporary world and exploring taboo themes. 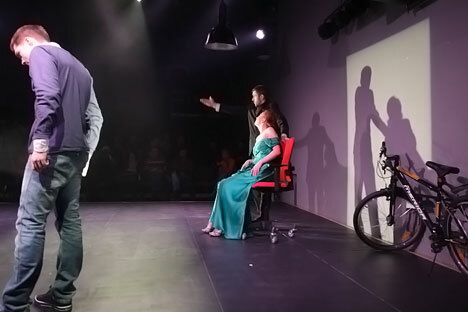 On an intimate Moscow black-box stage, four actors read their parts, including stage directions from the scripts in their hands. The tension builds as the actors transform into characters -- four young and aimless drunkards. The audience appears shocked and amused by the crudeness of “Life Smiled At Me”, which uses language unheard of in Russian theatres. A new breed of young Russian playwrights armed with razor-sharp tongues and a penchant for realism is charting new territory on the Russian stage, thus bringing a new lustre to the country’s theatrical reputation with its movement called “New Drama”. Their theatres are small and themes gritty and they are attracting daring talents and lively audiences. Theatre.doc, which produced “Life Smiled at Me” is best known outside Russia for performing a play about the life and death of lawyer Sergei Magnitsky, who died brutally in a detention centre in Moscow last year. “Life Smiled at Me” has been awarded a Golden Mask Award. The Golden Mask Theatre Festival is Moscow’s premier theater event and runs each year from March to April, closing with a showcase for cutting-edge work, called the Case Festival. Some foreign theatregoers are under the impression that the nation that gave the world Chekhov and Gogol may be resting on its laurels. Whatever collapse of confidence and creativity occurred in the 1990s has been replaced with an emerging theatre scene worthy of Konstantin Stanislavsky himself. Every night, roughly 30 theatergoers enter the tiny basement of “Teatr.doc”, which has a cult following in Moscow. There is a bit of a conspiratorial feeling inside, and one can sense a special chemistry between actors and audience in the spartan atmosphere and minimalist décor, as in the case of Zhizn Udalas (Life Smiled at Me). Like the Bauhaus, the theatre’s maxim is: “Less is more”. The New Theatre movement is causing a crack in the ageing facade of Moscow’s main street theatres. How long can Russia’s best-known directors ignore it? “Theatre must be contemporary,” thundered Marat Gatsalov, an actor and one of the movement’s leading directors who directed “Life Smiled at Me” and the much-acclaimed “Odds and Ends”. “Theatres are suffocating under the old plays, but they slam the door in our faces,” he said. What sets New Drama apart is its accent on contemporary themes. “These are people who write about the contemporary world with a contemporary outlook and language. We are not afraid of provoking. Our writing must be emotional," says Natalia Vorozhbit, a Ukrainian playwright. Don’t go looking for politics in most of these dramas. However, the Magnitsky play is more the exception than the rule. Dissent is at the core of the movement, but its writers have so far refrained from an open confrontation with the establishment. The idea seems paradoxical, given New Drama’s fearless treatment of taboos (at least in Moscow’s theatres) such as drugs, prostitution and homosexuality. These audacious themes perhaps account for the powerful emotive appeal of the New Drama. The movement is growing at a fevered pitch as at least one or two new productions make a debut every week. These new offerings are a pure act of faith, as they acquire new followers every night. With such success, wider recognition is only a matter of time. Do you feel you are a part of the New Drama? Everything started when I acted in Boris Khlebnikov’s film Free Floating (2006). The screenplay was done by Alexander Rodionov. I made new connections with extremely talented people. It’s exciting work for an actress. Is it more stimulating to act in a New Drama play than in a big Moscow theatre production? For me, the most important thing is the text. I have a voracious appetite for interesting and complex roles. Unfortunately, they’re rare. Who are your favourite playwrights at the movement? My favourite authors are Kurochkin, Ugarov, Durnenkov, Gremina, Rodionov and Bondarenko. Something deep is emerging from them. I appreciate plays where the writer doesn’t try to overdo it with airing dirty laundry; it seems that some writers compete to see who can use the worst language. There’s a branch of New Drama that is going in that direction and it's not for me. Can you define New Drama? It’s an entirely new movement that still doesn’t have a well-defined scope. The only clear definition is that it doesn’t have a kopek to its name. Beyond that, it’s a living and largely misunderstood process.